Chakrabongse Villas has won numerous awards including “Best Boutique Hotel, Asia 2012” and has received Fodor’s “Highest Recommendation” for 5* hotels in Bangkok. Their Riverside restaurant, famously overlooking the Temple of Dawn and the Chao Praya river, is equally famous and this new book contains all of their signature dishes. 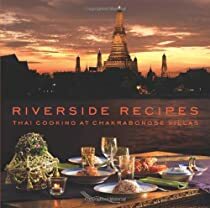 Riverside Recipes takes the reader through a wide range of Thai meals, from a typical Thai breakfast, through classic lunchtime recipes of somtam, fried rice and noodles to elaborate evening meals, featuring signature dishes from the restaurant.